This ‘What’s New’ page doesn’t list all changes. Changes of a regular nature, such as updating the list of events, addition of news or minor updates to existing content are generally not recorded. The Blakeney School Admissions Register 1864-1912 Added. Click here to see the register. On 14 May 2018 the BAHS released this new website with many new and improved features. As parts of the website have been converted using OCR (Optical Character recognition) there is a possibility of errors creeping in alongside the odd typo or worse so please email the webmaster with details of any problem you encounter. 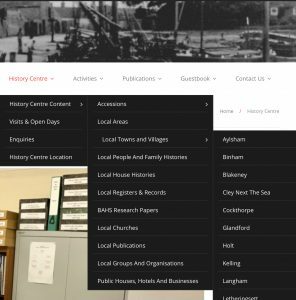 a significant increase in the amount of information covering what may be found the History Centre is available. This has been taken from various indexes produced over the years by History Centre Volunteers. If something is of interest a visit to the History Centre will be necessary. A Search option may be found at the bottom of each page. It allows searches to be made across the website including topics with forums. At present replies in the forum are not searched.